PALMER — A log export deal that promised to bring up to $1 million a year to the foundering Mat-Su port is on hold indefinitely. Chinese tariffs are largely to blame for suspension of the planned export of Susitna Valley logs to China, according to the company behind the venture. Matanuska-Susitna Borough administrators said little about the project this week despite calls from some in the public to provide a status update. Borough officials had estimated the project could drum up roughly $900,000 a year in wharfage, dockage and rental fees at the port, which is losing $800,000 to $1.5 million each year. Costly unrelated repairs are underway even as few if any vessels call at the docks. "There's no loss of interest, loss of appreciation or passion for this project," Denali Timber Management owner Eric Oien said Wednesday. "We're in a suspended position, meaning there's an unexpected abrupt market disruption that we're essentially waiting out." Starting over the summer, President Donald Trump's administration imposed tariffs on $250 billion worth of Chinese goods. China responded with tariffs on U.S. products. Amid the trade battle, Chinese tariffs on certain U.S. logs started at 10 percent last month and could rise to 25 percent in January, according to several reports. Some salmon products important to Alaska producers were pulled from a list of Chinese goods imported to the U.S. and subject to tariffs last month. Oien said he expects no similar help for Alaska timber. The timber deal that's been suspended was approved by the Matanuska-Susitna Borough Assembly in April and hailed as the salvation of the government-owned port. A partnership between players from New Zealand, Washington state and China, it involves a 24,000-acre borough timber sale known as Chijuk Creek, off Oilwell Road in the Trapper Creek area. Spruce trees in the area are riddled with beetle damage but valuable birch trees are mixed in with the dead and dying conifers. Logs would be trucked to the port at Point MacKenzie and shipped to China. The project faced support from Alaska wood products producers but criticism from some in the public. Logging contractor Charles Nash already had what one assembly member called a "checkered history" with the borough. Nash was the original purchaser of the Chijuk Creek sale back in 1998, but he later sued the borough after officials terminated the deal in 2002. A 2013 settlement with the borough led to Nash's continued role in the current project. Nash on Thursday blamed three things for the suspension: tariffs; lowered prices and currency devaluation on Chinese markets; and issues with Chinese customs officials facing U.S. wood exporters. Denali did some logging in Southcentral — not within Chijuk — in mid-July as talk ramped up about tariffs on Chinese goods. The logging occurred on Eklutna Inc. land in Eagle River. Crews cleared 40 acres before Denali got word from Chinese customers that markets were "tanking," Oien said. About 2,000 tons of logs ended up on the ground, with only a small amount trucked to the port and none of it shipped. Birch and spruce prices plummeted nearly 20 percent that month "due to currency fluctuations and negative sentiment brought on by the elevating trade dispute," according to a Denali fact sheet. The company now is trying to sell as firewood, fiber or wood chips those logs cut in July that could have grossed almost $1 million on the export market, Oien and Nash said. Borough Manager John Moosey answered few questions about the status of port rental payments or other aspects of the halted timber venture this week. "I am working with legal to resolve the issues," Moosey wrote in an email. He declined to make additional comments. Denali has made none of the payments it promised in the contract approved by the Mat-Su assembly in April, according to assembly member Jim Sykes, a Lazy Mountain resident who was one of two votes against the venture. Oien, however, did take the Eklutna logs to the port, Sykes said. They're still out there. Denali was supposed to pay nearly $28,000 a month to rent space at Port MacKenzie. "They haven't paid any lease payments," he said. Oien said he worked out a "deferral" at the port with borough officials and is hoping for a long-term solution. Denali ordered work associated with the Chijuk sale stopped by August. "One Monday morning, they suddenly just pulled out," said Trapper Creek resident Donna Massay, who lives along Oilwell Road. That was at the end of July. Denali invested more than $3.6 million in the Chijuk project, much of it on equipment, according to company estimates. About $100,000 was spent on a stormwater drainage system at the port, upgrading Oilwell Road, and building a promised parking lot for snowmachiners and hunters that was never finished. Massay said the last time logging trucks rolled down Oilwell Road was November. They carried wood samples bound for China. "The mess is still laying on the ground," she said, adding that could fuel beetle outbreaks in area forests at the heart of a massive infestation already. Several people have said they heard the Chinese customers for the wood found it to be of low quality. Oien said the sample "was met with perfect acceptance." Nash said Chinese buyers processed the logs, mostly birch, to make sure they met standards for lumber or plywood and "there was no problem there." Very few of the mostly dead spruce trees within the sale are marketable as saw logs, he said. The borough has yet to make any official statements about the status of Chijuk Creek or the export deal. The lack of updates surfaced Tuesday night at a borough Assembly meeting during deliberations on a transportation plan triggered by concerns about log truck traffic surrounding Chijuk. One Assembly member described the timber sale as "on its way out" and "failed," while another talked about the project in past tense. The lack of clear information about the venture rankled Eugene Haberman, a self-appointed government watchdog who often complains about a lack of public process in borough decisions. "Is the borough being paid for agreements dealing with timber?" Haberman said during the meeting, directing his question to Moosey. "That should be addressed here tonight. … The silence is wrong." 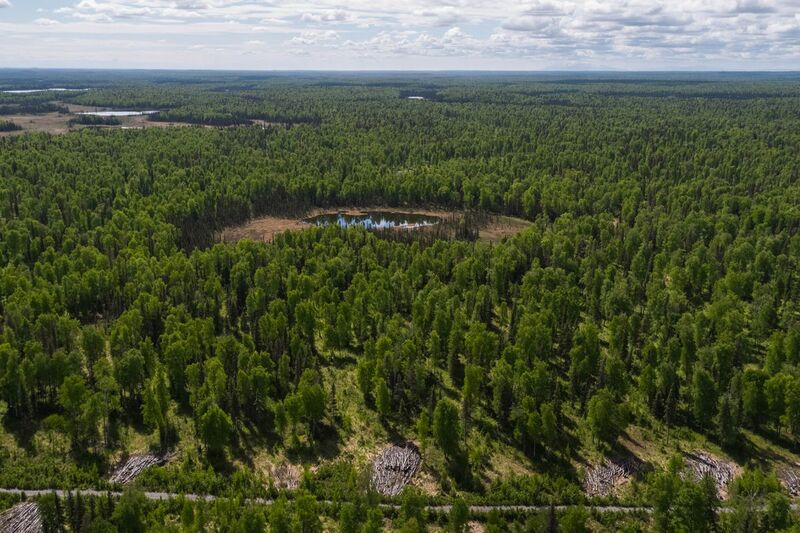 Note: This story was edited to reflect that Denali Timber Management did not do any logging in the Chijuk Creek timber sale but instead cut trees on Eklutna Inc. land in Eagle River.